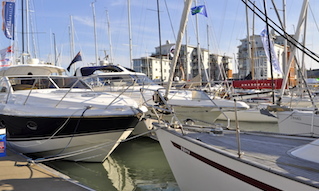 The detached Cowes Breakwater provides shelter and protection to the Inner Harbour, central day class moorings, vessels in the harbour, marinas including Cowes Yacht Haven and Cowes Harbour Shepards Marina, Red Funnel ferries, and waterfront businesses in West and East Cowes. 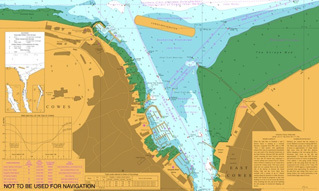 Cowes Breakwater is marked with five GPS-synchronised yellow lights spaced equidistant along the breakwater crest, displaying flash characteristic Fl.Y.2.5s. In addition, the western toe, which lies on the Inner Fairway extremity, is marked by a red lateral mark Fl.R.2s and the eastern toe by an east cardinal mark VQ(3).5s. Diagram showing the detached Cowes Breakwater. 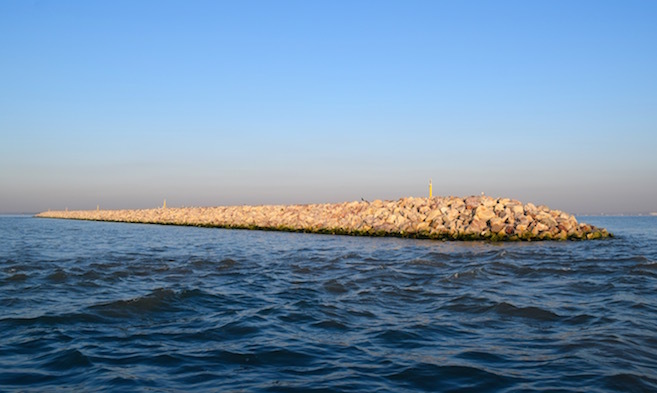 Mariners are advised to remain at least 30m from the breakwater crest as the rock-armoured structure extends 25 metres to the north and south, and to avoid passing between the buoys marking the western and eastern toes and the breakwater. As can be seen from Figures 1 and 2 below, there is limited clearance over the toes of the breakwater, so do not be tempted to cut inside the buoys or you may find yourself aground and holed, particularly around Low Water. Diagram above: A transverse cross-section of Cowes Breakwater showing extent of submerged toes. 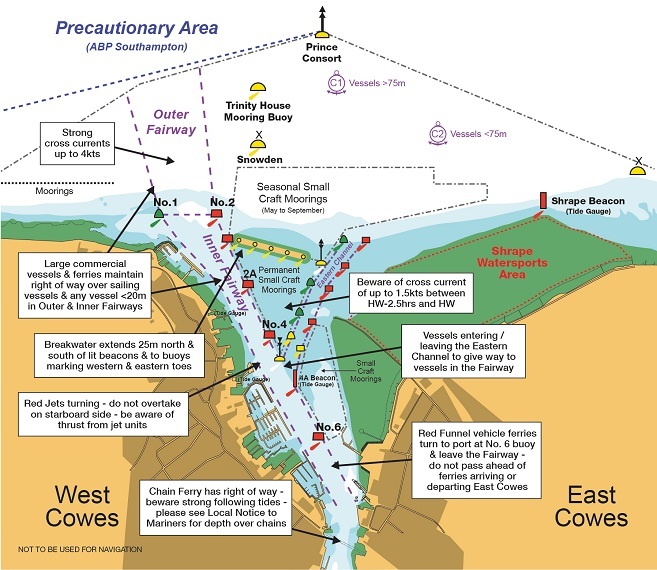 Diagram below: The western end of Cowes Breakwater and suggested safe routes. In addition, sailors are advised that a large wind shadow may exist on the lee side of the breakwater, particularly in light winds. 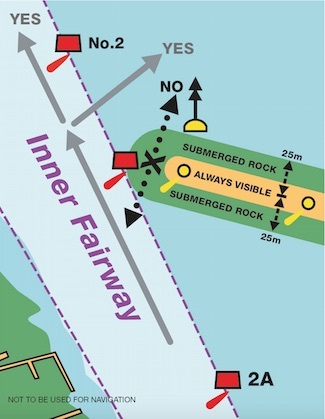 Mariners are also reminded that if you are travelling east-west along the northern side of the breakwater, you may not be visible to craft northbound in the Inner Fairway, and you should avoid entering the Inner Fairway close to the breakwater toe so as to allow a full appraisal of the situation. 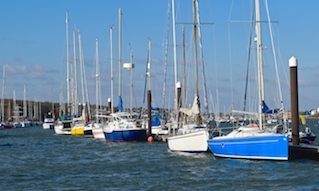 All mariners shall avoid passing through the area south of the breakwater due to the presence of moorings and the limited depth of water unless proceeding to a mooring in the immediate vicinity. The Cowes Breakwater is private property. 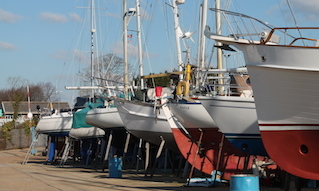 Landing is strictly prohibited and an offence under the Cowes General Directions. See also Cowes Local Notices to Mariners for more information.